What comes to mind when you picture the Southwest Region of the United States? Maybe it's the miles of deserts found there or perhaps you think of one or more of the natural wonders such as the Grand Canyon or Monument Valley. You also may think about the numerous Native American Indian tribes that live there. On this page you will find lists of interesting facts and information about the Southwest Region of the US which encompasses the four large states of Arizona, New Mexico, Oklahoma, and Texas. There are links on this page to information about each state in the Southwest geographical region written for both adults and kids. Click here for a great selection of Amazon.com books about the Southwest. List of states in the Southwest U.S. The Southwest is generally a region of wide open, sparsely populated spaces, a lot of which is desert, with a few densely populated cities. The geography of the Southwest includes deserts, mountains, plateaus, mesas, broad basins, and plains. The climate in this region of the US is basically semi-arid to arid; however areas in this region with a high elevation can get very cold and receive significant snowfall. Some of the common types of plants found in the Southwest Region of the US include yucca plants, sagebrush, barrel cactus, and saguaro cactus. This region is inhabited by many different types of animals; most of which have adapted to survival in the hot dry climate that dominates the region. Examples of some of these animals include the rattlesnake, coyote, bobcat, jackrabbit, gray wolf, prairie dog, American bison, Coral snake, and Elk. There is a large population of Hispanic Americans living in every major city in the Southwest. A large number of American Indian tribes use to inhabit the southwestern United States. When Europeans arrived in the region many of these Native Americans were pushed off their land or died from the many disease brought by the European settlers. These indigenous tribes include the Apache, Comanche, Ute, Navajo, and the Hopi. The construction of numerous dams on the Colorado and other rivers in this region have allowed once small towns such as Phoenix Arizona and Albuquerque New Mexico to thrive and become major cities. 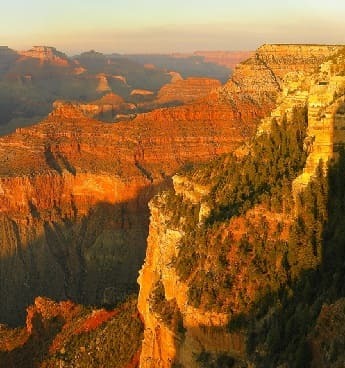 Grand Canyon: Located in Arizona this amazing canyon was carved by the Colorado River over millions of years. This amazing natural attraction is visited by approximately 5 million visitors every year. The Four Corners Marker: This Southwest Region point of interest is a monument where the states of Arizona, Colorado, New Mexico and Utah all meet. It is the only place in the United States where four states meet and is considered the heart of the Southwest. The monument is in a remote area where very few tourists visit it. Monument Valley: Located near the Four Corners Marker on the border of Arizona and Utah this Southwest point of interest has numerous sandstone buttes that tower above the valley floor.